To Shake or to Stir? Learn the tricks for determining when it's best to shake your cocktail and when it's best to stir. Remember the James Bond request for a martini “shaken, not stirred”? Sorry, Mr. Bond, no self-respecting mixologist shakes a martini. But that’s not true of all cocktails—it’s tough to know when to shake and when to stir. That’s why Wine Enthusiast asked Jason Asher, founder of the beverage consulting business AZ Mixology about the tricks of the shake or stir trade. • Shake cocktails made with citrus or other juices. • Shake cocktails made with cream, eggs or other dairy products. Forget about the “hard shake” or other fancy techniques. A basic, straightforward shake is all that’s needed to chill, aerate and dilute a drink. One sign of a well-shaken cocktail is a frothy edge in drinks made with cream or eggs, or a fine blanket of ice shards on top of a clear cocktail. Asher recommends a standard Boston Shaker tin and pint glass as great tools, as they are “perfectly formed to add air to the shaking.” He adds cocktail ingredients to a pint glass and then fills it to the top with ice. “The bigger and denser the ice, the better,” he says, since smaller ice can dilute faster, resulting in a watery drink. Next, make sure the tin is inverted on top of the glass, then give it “a nice little hit on the top” to create a seal before shaking the drink vigorously. For how long, you ask? Bartenders love to quote Harry Craddock’s 1930 bar guide, The Savoy Cocktail Book: “Shake the shaker as hard as you can. Don’t just rock it, you’re trying to wake it up, not send it to sleep!” The drink should then be strained into the glass, either straight up or over fresh ice. • Stir cocktails made entirely of spirits, including bitters, such as a Negroni, or a classic James Bond-style gin and vermouth martini. The exception is a cocktail made with cream liqueurs, which should be shaken. Compared to shaking, stirring is more gentle—a technique intended to delicately combine ingredients and minimize dilution. 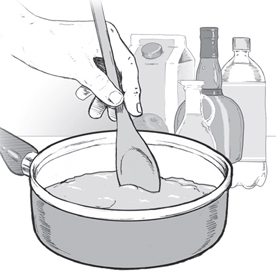 Use a long-handled bar spoon and stir the drink in circles. “Around and around, not up and down,” Asher says. And keep in mind that it takes longer to chill a drink by stirring than by shaking. “A good 6–7-second shake is equivalent to a 30-second stir,” he says.